The 3-4 Defense System can shut down your opponents next season with a simple approach to creating complexity. The 3-4 Defense has become increasingly popular because of the flexibility to defend everything from downhill rushing attacks to elaborate Spread Option and RPO offenses. In today’s episode we’re going to look and the 3-4 Defense System that is a part of JDFB Insider. The 3-4 Defense System gives you a simple approach to defense. But with an added complexity and flexibility you can use as needed. 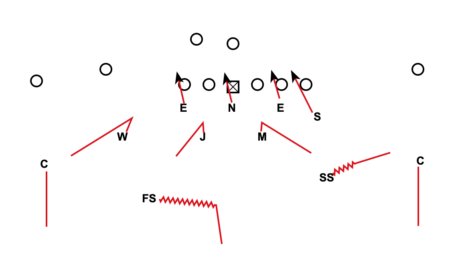 We’ll talk about the base front, stunts, and blitz package that are taught inside the system. You can also download alignments to standard formations in PDF format above.